Is is just us or does that flight path look like a plumber's wrench? Is there a plumber on board? A Norwegian Air Shuttle flight with dozens of plumbers on board had to be flushed after it was discovered 15 minutes after takeoff that the toilets were out of order. The flight was carrying about 85 plumbing industry workers to Munich for a trade event, Norwegian newspaper Dagbladet reported. "So many plumbers on an aircraft and it has to turn back due to toilet trouble. That is enough to make you laugh," plumber Hans Christian Ødegård told the paper. 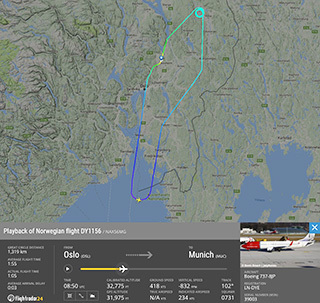 The flight left Oslo Airport Saturday morning for a two-hour journey to Munich. However, the flight was forced to turn around while flying over the Swedish border. The flight data website Flight Tracker shows the plane’s route. It touched back down a little more than an hour after departing. So, the big question: why couldn't the aircraft full of plumbers fix the lavatory? There’s a very straightforward answer. "We’d have gladly fixed the toilets, but it must unfortunately be done from the outside and we didn’t want to take a chance on sending out a plumber at 10,000 metres altitude," plumbing executive Frank Olson, a passenger on the plane, told the Norwegian newspaper.